Dry roast the above ingredients and finely powder. 1. Cook and mash the horsegram. Keep aside. 2. In a pan, add oil. Add onion and tomato.Saute for few minutes. 3. Now add tamarind juice, water, salt and sambar powder. 4. Once the raw smell of the sambar powder is gone, add horsegram (Kollu) and masala powder. 5. Medium the flame and allow the contents to boil well. 6. Temper and then garnish with corainder leaves. 7. Serve hot with rice ot roti. super and awesome and delicious sambar. 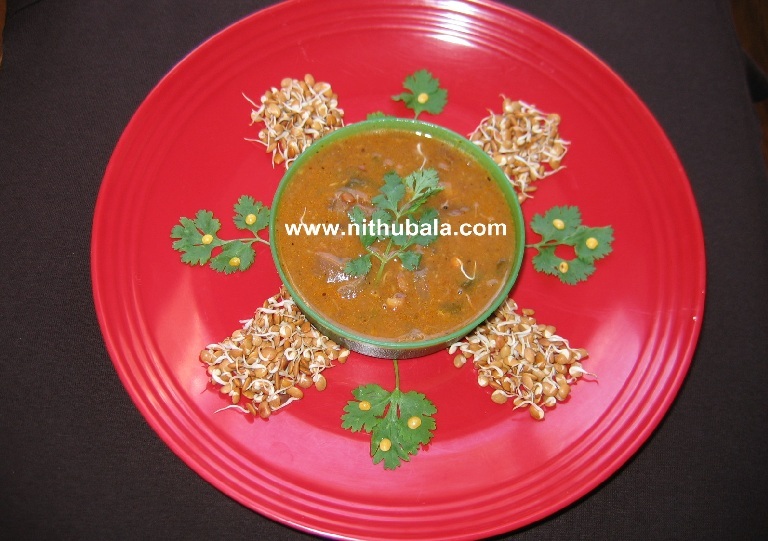 Wat an excellent and nutritious sambar. that's a healthy choice,lovely preparation...looks inviting dear!! Very healthy and delicious..never tried sambhar with sprouted horsegram..will try for sure..
healthy and delicious one, new to me..
Wow....a very nutritious and novel sambar....am sure to try this! Thanks for coming over to my place and leaving me a sweet comment:)You have a wonderful blog too - happy to be your 350th follower!Do keep on coming back!